There are many varieties of Staffordshire animals. Like with Noah's Ark, they usually come in pairs. If you're looking for a particular animal, ask Elinor. My menagerie is so large, I've included only a fraction on this page. Cows: Cow creamers have been the flavor of the month for some time. These have cute maids and original tails, 5" x 8" and they are $675 each. I also have a pair of red and whites, almost identical to the left cow which are $1700. Giraffes: This pair of small (5 1/2") giraffes are c1900. Usually in dismal condition, these palm trees are great.. Examples of the Kent pottery which continued into the 20th century using the Parr moulds. $850. 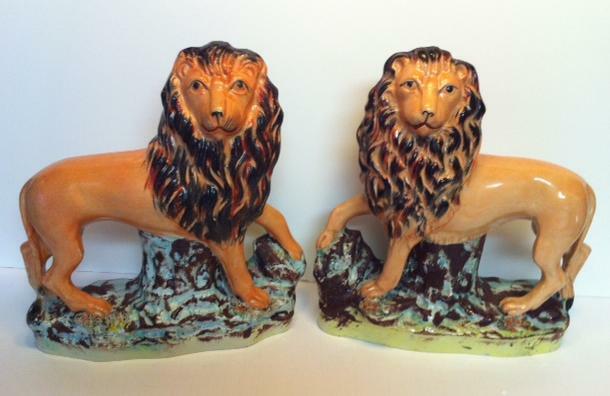 Lions: Rare pair of large free-standing lions, 10" tall, c1860, probably another example from the Parr pottery or, at least, the same neigborhood. $2,400. Leopards: All these leopards are examples from Thomas Parr. 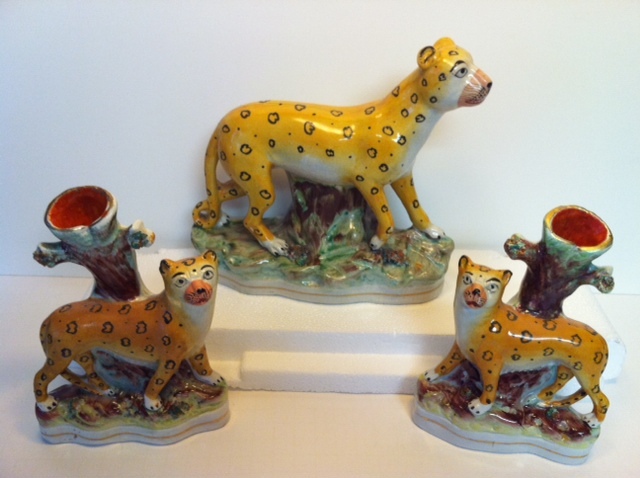 The big walking leopard at the rear is $3250 and a pair is $7000. 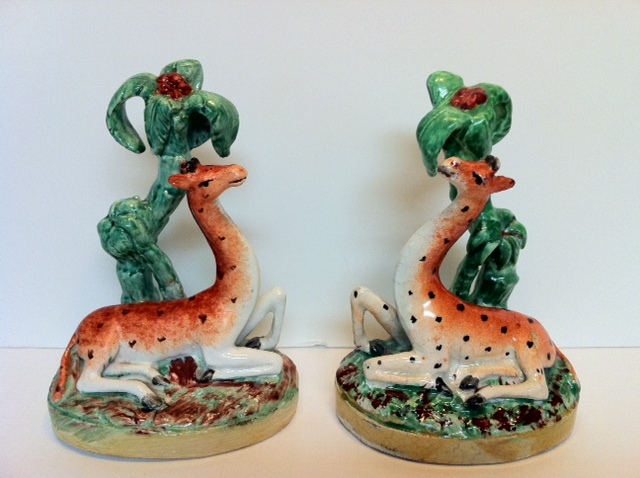 The smaller models with spill vases are 6+ inches tall, have beautiful painting, great faces, $2200. 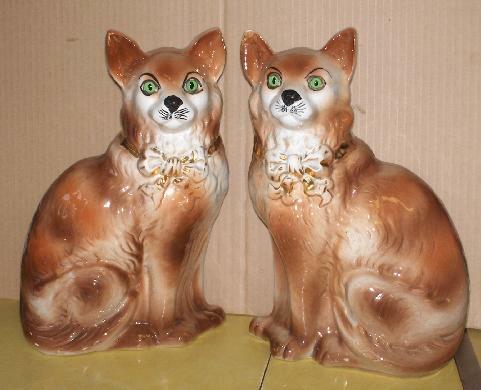 Cats: These orange cats are from the Bo'ness pottery in Scotland, last part of the 19th C. They are a foot tall and have green glass eyes. $950 pair. Also come in grey. You can search bonesspottery.co.uk , a really interesting website..
﻿﻿Hens should have speckles on their backs and are always facing to the left if they are the best 1860 examples. More info on hens in my collecting and decorating pages. White $450 and colored $650 for the 7 inch size.